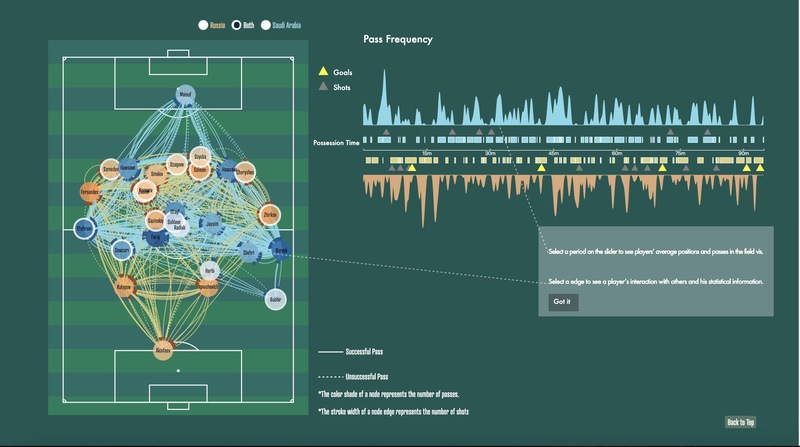 A data visualization system that demonstrates team competence and team play pattern in 2018 FIFA World Cup. FIFA World Cup is considered a feast for all the soccer fans. It builds up the stage where superstars compete with each other. It gives an overview of the trend of play patterns. This data visualization aims to demonstrate team competence and team play pattern in 2018 FIFA World Cup. The potential users are soccer fans, soccer coaches, sports journalists, soccer analysts. Our users include amateur level to proficient level of soccer audiences. We incorporated secondary research (sports news, literature review) and interviews with 4 soccer fans. We digged into the questions they care about before and after watching 2018 FIFA World Cup. III. locations demonstrating where the events happen on the soccer field and formation of a competing team. The most commonly used data visualization for network data is arc diagram, matrix representation, ribbon diagram, chord diagram. We chose chord diagram for its advantage above other 2 alternatives in showing this particular dataset. According to our research, heat maps are a common visual representation for location-based data. Lots of events happened on soccer field in 90 minutes. The chord diagram can be “hair of string” (refers to the problem of information overload). The soccer field can be too busy for users to trace the soccer star he/she likes among piles of dots and lines. Time can be used a filter which allows the users to freeze whichever a frame or time period he/she is interested. A slider is an ideal and instinct design choice. Professor John Stasko said preserving soccer field layout helps users delve into fields, and provide context for a match. So our visual styles was developed based on soccer field color scheme. Schneiderman's Mantra is the most important principle for data visualization we've learned from class. The principle guides us to rank the user tasks and visual elements. Who are the players that interacted most frequently? How did a player perform in a game? Who scored in the match? How did an attacking attempt proceed? When did the dramatic events happen? How did an attacking proceed? Did the tactics change over the whole match? Did the tactics work in the match? In general, Prof. John Stasko suggested that our first mockup focused on the scope of individual players, and that more design choices should be explored to provide overview of the information. Also, the first design intent relies heavily on users' ability to retain the information, especially when they are searching for a series events (compare the most dramatic moment). Tufte's principle for information display is one of the most important guides for design in data visualization. We revised our first mockup based on Tufte's principles to better serve the user tasks. Data/ink ratio refers to proportion of a graphic's ink devoted to the non-redundant display of data-information. Tufte's principles suggest that data-ink ratio should be maximized, and that redundant data-ink should be erased to tighten the visualization. We reexamined our first mockup, and found the two chord diagrams show repeated information (interactions among players) as nodes and links on the soccer field. Therefore, I decided to combine them. The design challenge is how to map interactions to locations. the position can be equivalent to real time position if the user select a short range of time. Show real time position of the players who get involved in the pass/shot/goal events as the user drag the time slider. Each edge shows one pass/shot/goal. One player can have multiple presence if he had multiple passes. Fix position to its formation. The stroke width of the edge shows the frequency of interaction between two players. misleading position and passing routes. Micro-macro composition is a technique that a pattern emerges from a pile of details. Since our first design intent lacked the overview, we decided to show pass frequency on the timeslider. The idea was inspired by dynamic query slider, which serve multipurpose--as selectors and distribution chart. The important moment in a match, such as a shot or a goal, is highlighted as bookmarks on the slider. "the various elements collected together... interact, creating non-information patterns and texture." is referred as "1+1 > 3". Showing possession time of the rivalry teams composes two mutually complementary lines. The absent part of the lines provides references for the play pattern of the team and the situation of the team. click one player to see the personal information and statistics of pass accuracy, shot attempts. By selecting a segment of timeline, the soccer field presents events and players involved in that time range. One key drawback of encoding involvement with size is that when loading the default view of the whole match or when user select a long range of time, the largenodes will cover information. Alternatively, we encoded involvement with opacity for a clean overview. When a user clicks on one match, he/she will be directed to the soccer field view. how far a team went --colors of edges. they favored the diagram arranged in groups. "It is more like a ritual to arrange the teams into groups. It feels like instinct for me to find my favorite team France in group C."